I think it’s safe to say that Logitech has been crafting some really solid gaming mice lately. Back in March, I reviewed the G703 and G903 gaming mice, which both come with all the bells and whistles: RGB lighting, Powerplay support, HERO sensors, and LIGHTSPEED technology. I found them to be excellent mice, and I said at the time that they made the best argument yet for ditching your wired gaming mouse. With both of them, however, there was one big hang up: Price. The G703 and the G903 are not cheap mice. At $100 for the G703 and $150 for the G903, you’re certainly putting a lot of money toward peripherals, more than you would have spent on some of the hardware that makes your computer do all the wonderful things it can do. When you toss in the $100 price tag of the Powerplay charging mat – which charges the G703 and the G903 as you use them – you’re looking at a lot of money for items that at one point would have been the cheapest part of your build. I certainly think there’s a subset of PC gamers who would pay that amount for something like the G903 and the Powerplay mat and be perfectly happy with their purchases. What about the rest of us, though? What about those of us who salivate at the idea of wireless latency so low that it’s virtually indistinguishable from most wired mice, but don’t have the kind of cash to drop on Logitech’s top-of-the-line offerings? 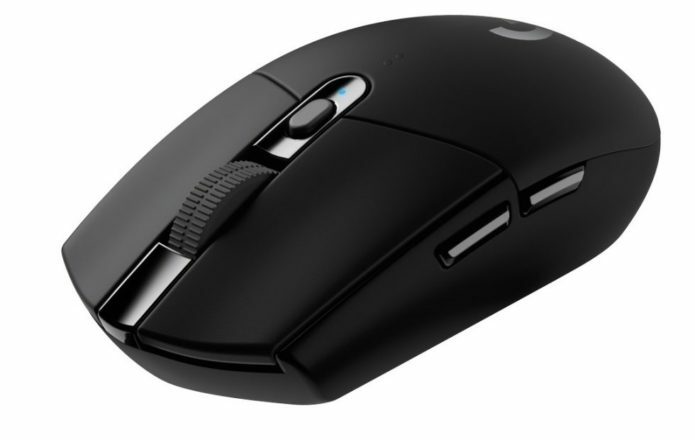 Up until recently, that was a question without an answer, but then Logitech released the G305. At $60, the G305 is a lot less expensive than the G703 and the G903. Obviously, that lower price comes with a few concessions on the hardware side of things, so now the big question is whether or not the G305 is a good alternative to those who want the capability of the G703 or the G903 but don’t want to break the bank. The answer, to my surprise, is yes. I’ve been testing the G305 for a little while now, and I’m pleased to report that this mouse can roll with the big boys – for the most part, at least. You miss out of a few of the exciting features in the G703 and the G903 by opting for the G305, which is to be expected, but in the end, this is still a mouse worth considering if you’re searching for the increasingly obscure area between top-of-the-line and bottom-of-the-barrel. The design of the G305 is rather basic, as you’d expect. It carries Logitech G branding on its palm rest just like every other Logitech G mouse, but the difference here is that the logo isn’t illuminated by RGB lighting. Instead, the Logitech “G” is painted a silvery-white that glimmers ever so faintly when it catches the light. There are five buttons in all on the G305. You’ve got your standard left and right mouse buttons, along with a pair of thumb buttons on the left side of the mouse, making this a right-handed device unless, of course, you lefties have figured out how to hit those shoulder buttons with your pinky (and if you have, give yourself a pat on the back because that’s impressive). The fifth button joins the scroll wheel in the middle of the mouse, and it allows you to change your DPI settings on the fly – a nice thing to have, as it allows you to optimize your mouse sensitivity quickly depending on the game you’re playing. The G305 also doesn’t support Powerplay, which really shouldn’t be much a surprise. Instead, it’s powered by a single AA battery. Logitech says that a single battery is enough to provide 250 hours of game time, though you also have the option of increasing report time slightly (from 1ms to 8ms) with “endurance mode” to increase battery life to a whopping nine months. Unfortunately, I haven’t had the mouse long enough to test either of those claims. Like other Logitech G peripherals, the G350 is compatible with Logitech Gaming Software, but the controls you have are relatively simple. This is where you’ll activate the aforementioned endurance mode and extend your battery life significantly. You also have the option of customizing your DPI settings and tying custom commands to each button on the mouse. It’s nice to see the G305 get some love and customization options within LGS, because we normally wouldn’t expect that from a budget mouse like this. The mouse feels a little on the small size, and it doesn’t fill our your hand nearly as well as something like the G703 does (the G305 isn’t as tall and not quite as long as the G703). It took a little while to adjust after I switched from the G703, but once you get used to it, I think that the G305 mostly feels fine in the hand, if a little light. Its smaller size is understandable, as this is meant to be a portable mouse you can take with you on the go. The Bluetooth dongle the G305 connects to fits snugly under the cover that houses the battery, so you can pack up everything you need within the mouse itself and drop it in your bag. While I can see size being a sticking point for some people, it certainly accomplishes its goal of being a portable mouse that can easily connect to anything with a USB port. The biggest draws of the G305, however, are its LIGHTSPEED functionality and its HERO sensor. These are two components that show up on Logitech’s more expensive mice, so to have them available on a mouse priced for the mainstream is very exciting. While I’m not anywhere near the skill level of a pro gamer and therefore don’t need the ultra-low latency LIGHTSPEED provides, I will say that there is no noticeable difference between the G305 and the G703/G903 when it comes to in-game performance. Both LIGHTSPEED and the HERO sensor seem to work flawlessly on the G305, and they help it stand out from a sea of other wireless mice – some of which aren’t much cheaper than this in the first place. For anyone who has been watching Logitech’s advancements in the wireless space, the fact that these features are available on a $60 mouse should make this a very intriguing device. While the G305 doesn’t feel quite as good in the hand as the G703 or the G903 do, that’s really the only complaint I have about it. It lacks some of the bells and whistles of more expensive mice in the Logitech G line, but if you can live without things like RGB lighting and Powerplay support, the G305 becomes quite an impressive mouse for the money. I’m happy that Logitech is making technologies like LIGHTSPEED more accessible to mainstream consumers with this release. It’s a really impressive technology that finally got me to ditch wired mice, and I think it needs to be in the hands of more gamers. Furthermore, its battery life, portability, and subtle design mean that this can be a good daily driver for pretty much anyone, regardless of whether or not they’re gamers-by-night like so many of us are. As long as you don’t mind a lightweight mouse that isn’t outfitted with RGB lights like so many PC peripherals these days are, I think you’ll find that G305 offers a lot of value for the money.